WELS Christian Aid and Relief is now coordinating volunteers to help with cleanup and rebuilding efforts after Hurricane Michael. Efforts are primarily focused on Amazing Grace, Panama City, Fla., which was hit directly by the storm. Amazing Grace’s church and parsonage experienced extensive damage, as did homes of several members and many in the community. WELS Christian Aid and Relief quickly mobilized two of its relief trailers after Hurricane Michael struck the Panama City area and began coordinating volunteers to help with the cleanup project, including a group of 10 students from Martin Luther College (MLC), New Ulm, Minn.
Zambo notes that volunteers will continue to be needed for months as work progresses on the church, parsonage, six to eight members’ homes, and homes of those in the community. Amazing Grace is currently worshiping at a nearby Christian camp facility, and its vacancy pastor, Rev. Jerome Enderle, and his wife are living in rented housing provided by Christian Aid and Relief. Christian Aid and Relief has provided $108,000 toward this relief effort to this point, and more grant requests are expected. Monies distributed have been allocated for items such as supplies, building materials, gift cards, and volunteer expenses. Christian Aid and Relief is partnering with Kingdom Workers’ Builders for Christ as the rebuilding process begins. Builders for Christ provides volunteers with building skills to serve alongside Christian Aid and Relief volunteers. To apply to serve as a volunteer to help with cleanup and relief work through WELS Christian Aid and Relief, visit wels.net/relief and fill out the volunteer form. The administrative committee for WELS Christian Aid and Relief approved $317,403 for humanitarian aid work in fiscal year 2018-19. These are projects developed by WELS home and world missionaries to reflect Christ’s love to the people of their community and open doors to share the gospel. Projects range from providing school supplies, outfitting medical supplies, drilling drinking water wells, and offering literacy and skills classes. Eighteen mission fields, both home and world, will be receiving humanitarian aid funding. Hein explains that all projects originate in the mission fields as the missionaries discover opportunities to help. Then the projects are brought to the Christian Aid and Relief administrative committee as well as to the WELS Missions administrators for approval. Every project that met the criteria received funding for the 2018-19 fiscal year. To view a complete list of humanitarian aid projects, visit wels.net/relief. WELS Christian Aid and Relief has announced its plan to call a disaster response coordinator for Puerto Rico who would serve for one year and work with the national pastors of the Confessional Evangelical Lutheran Church of Puerto Rico to identify and prioritize specific needs, plan construction and repair projects, and coordinate volunteer efforts. He would also help to coordinate continuing theological training for two men whose training was interrupted by Hurricane Maria last fall. The decision was made after President Mark Schroeder, World Mission Administrator Rev. Larry Schlomer, Director of Missions Operations Mr. Sean Young, and Rev. Tim Satorius, WELS Liaison to Puerto Rico, went to Puerto Rico in January to meet with national leaders and discuss further the most effective ways Christian Aid and Relief could help the hurricane-devastated island. Christian Aid and Relief approved the Puerto Rican church leaders’ request to engage a Spanish-speaking WELS pastor for one year. This pastor will help coordinate the logistics of rebuilding the church in Humacao that was taken out by the hurricane and repairing the damages to the church building in Guayama. He will also oversee the relief efforts of WELS resources and volunteers in Puerto Rico. Finally, he will encourage and guide two young men in their pastoral training so they can lead these churches into the future. Following Hurricane Maria, Christian Aid and Relief already has helped provide groceries to families in need and sent an immediate gift of $5,000 through Direct Relief. An additional $5,000 was provided for meals for people in the church and community suffering from this disaster. This enabled members of the national church to provide meals for 50 people a day for four weeks. Learn more about Christian Aid and Relief at wels.net/relief. By now, everyone knows about the impactful hurricane season last fall. Countless people in Texas, Florida, and the Caribbean were affected. Some of these people were WELS members and their communities. That’s where WELS Christian Aid and Relief stepped in to offer assistance via immediate financial support and long-term clean-up and repairs. Christian Aid and Relief has been coordinating volunteer efforts, enabling WELS members to help their Christian brothers and sisters affected by the storms. In Florida, volunteers used Christian Aid and Relief trailers filled with supplies as they assisted with clean-up efforts in several affected communities. Local congregation members and school children helped with the efforts as well as canvassed the neighborhoods. Financial grants were also distributed to help families refurbish and repair their homes. Financial assistance was provided to families from Barbuda who were displaced from their homes. Some are staying at members’ homes from St. John’s, St. John, Antigua. Hard-hit Puerto Rico, home of WELS’ sister church body the Evangelical Lutheran Confessional Church, was visited by WELS President Rev. Mark Schroeder; WELS liaison for the field, Rev. Tim Satorius; and World Mission representatives in January. One church there was completely destroyed, and several members’ homes were damaged. Groceries were provided to families in need, and Christian Aid and Relief has been getting bids for repair projects. An immediate gift of $5,000 through Direct Relief was made to assist those in need as well as $5,000 to provide meals for people in the church and community. Perhaps it was Texas’ Hurricane Harvey that had the biggest impact on WELS members. Several members’ homes were flooded, resulting in mold and rot issues. Christ Our Savior church and parsonage in Angleton, as well as Sienna Lutheran Academy in Missouri City, suffered considerable damage. In the days following the hurricane, 40 WELS members from the greater Austin and Dallas/Fort Worth area traveled to the affected areas of Edna and Victoria to offer support and relief. Christian Aid and Relief provided two trailers filled with generators, chain saws, and other supplies and equipment to use for the clean-up of at least 50 homes. In the weeks and months following the hurricane, after full assessments had been made, Christian Aid and Relief coordinated a steady stream of volunteers to help remove, repair, and replace damaged drywall, floors, trim and molding, and roofs of members’ homes. Rev. Marc VonDeylen and his wife Monique, Lord of Life, Friendswood, live in a neighborhood that experienced heavy flooding during Hurricane Harvey. The night the storm hit Marc had to sleep at the church because the waters were rising so fast that he couldn’t make the short drive home. Meanwhile, at their house, Monique hosted unexpected visitors . . . neighbors she didn’t even know from down the street who couldn’t make it the few blocks to their driveway. While the VonDeylen’s home was spared from flooding, the area around them wasn’t. The day after the storm, the VonDeylens called their members and found out that eight or nine homes were flooded. They started getting everyone together to help each other. “We started seeing a great outpouring of love from our members at that point,” said Marc. Congregation members went from house to house to remove damaged items. They even opened their homes to their fellow Christian brothers and sisters whose homes were being repaired. Visit wels.net/relief to learn more about WELS Christian Aid and Relief. Thank you for your prayers and support of the ministry of WELS Christian Aid and Relief. We are using the generous gifts of God’s people to help those suffering from disasters and medical and financial trials, as well as support humanitarian aid projects, which help our missionaries build bridges to proclaim the gospel. Christian Aid and Relief personalizes our efforts by working through our congregations and missions in the affected areas. We work through our pastors and congregational leaders to make assessments and to distribute aid. We bring in volunteers when requested to assist in the recovery effort. 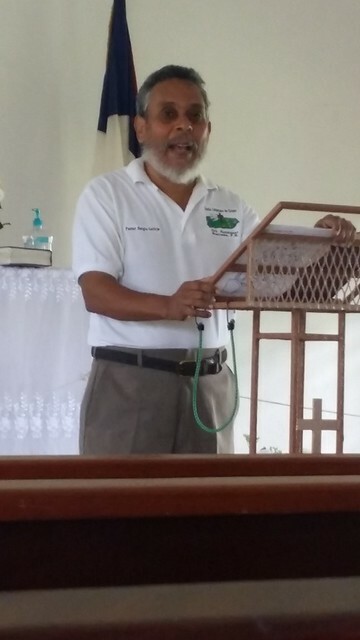 Our liaison to Puerto Rico, Pastor Tim Satorius has been in contact with pastors and leaders of the Confessional Evangelical Lutheran Church of Puerto Rico. Pastor Satorius and a representative from Christian Aid and Relief made a personal assessment visit to Puerto Rico in October. One church there was completely destroyed and several homes of members were damaged. Groceries were provided to families in need. We are getting bids to consider for repair projects. We sent an immediate gift of $5000 through Direct Relief to assist those in need. We also sent $5000 to provide meals for people in the church and community suffering from this disaster. The present plan is for members of the national church to provide meals for 50 people a day for four weeks. Volunteers from neighboring churches helped with the initial cleanup efforts in several affected areas. We have a project coordinator and volunteers in place repairing a parsonage and church at Christ our Savior, Angleton, Tex., the school at Sienna Lutheran Academy, and about 17 member homes in the Friendswood, Tex., area. The work is going smoothly and the volunteers are finding joy serving the Lord as they serve these people in their time of need. We have also provided grants to replace furnishings and appliances which were ruined by the flooding. We continue to consider new opportunities. Volunteers, with the help of our relief trailers, assisted with the cleanup efforts in several affected communities. Those who have received assistance are most appreciative and wish to express their gratitude for a job well done. Pastors in the affected area continue to bring requests to us for immediate aid for their members through our District President Chuck Westra. This includes generators and equipment, rental assistance while being displaced from home, and assistance with cost of repairs and replacement of furnishings. We also assisted Abiding Grace, Covington, Ga., as their church suffered water damage from the storm. Assistance is being provided to families displaced from Barbuda, who are staying with members and friends of our WELS mission, St. John, Antigua. 29 families received $18,000 in immediate aid so far. Our liaison Pastor Tom Spiegelberg visited Antigua last month to help us make further assessment of needs and opportunities. The Thanksgiving holiday offers another opportunity to count our blessings and praise God from whom all blessings flow. When we consider the physical and spiritual blessings God lavishes upon us by his grace, we realize that our cup of blessings richly overflows. One way we express our gratitude to the Lord is by reflecting his love and compassion to others. May the Lord bless our efforts to show love and kindness to those in need! When people are hurting, Christians respond. Paul thanked the Macedonian Christians for the generous outpouring of support they provided for needy brothers and sisters in Jerusalem. They saw a need, and their love for their Savior and fellow Christians moved them to act. The same could be said about the members of our synod in the way you have reacted to the hurricanes that struck Texas, Florida, and Puerto Rico. In addition to your prayers, you offered generous financial support to help those in need. As of now, WELS members have given nearly $700,000 for hurricane relief. WELS Christian Aid and Relief has made grants to WELS congregations in Texas and Florida to address immediate needs for their members and for others in the community and has sent aid to Puerto Rico. Efforts are now underway to plan a more long-term effort to provide assistance. When plans are in place and can be administered effectively, WELS Christian Aid and Relief is ready to forward the funding that WELS members have provided. We have been attempting to contact our sister church in Puerto Rico, but communications have been very difficult. We have heard there was extensive damage to at least one of the churches on the island, and we assume that the homes of many members were damaged or destroyed. As soon as we can assess the need and put plans in place, more assistance will be sent. Even as WELS members have responded to these natural disasters, they have also continued their faithful support of the ongoing ministry of our synod. Through September, Congregation Mission Offerings are up 1.6 percent or $231,000 over the prior year and 0.8 percent ahead of subscriptions. Thanks be to God for these blessings that have been motivated by his saving gospel. Pastors and leaders from Florida and Texas are continuing to meet and evaluate the needs of their members and communities following Hurricanes Harvey and Irma. Florida pastors and South Atlantic District President Chuck Westra met with a representative from WELS Christian Aid and Relief Mon., Sept. 18, to assess the needs and discuss opportunities. Local volunteers have deployed the Christian Aid and Relief trailers, outfitted with tools and supplies for relief work, to the Jacksonville, Fla., area to help with cleanup efforts. A group of Christian Aid and Relief volunteers will be arriving in Florida on Fri., Sept. 22, and staying for a week to tackle cleanup projects in Merritt Island and West Melbourne, two of the harder hit areas. So far, reports of damage to WELS churches and members’ homes have been minimal from Irma. Minor roof damage and downed trees account for the majority of the reports. Local groups have come together to clean up the most urgent areas, including members from the churches in the Divine Savior school association getting together to help clean up trees and debris around the school. “It was pretty exciting that as we’re starting this new association with one another we see a firsthand account of brothers and sisters in Christ joining together to do a bigger, better job than we could’ve done ourselves,” says Rev. John Boggs, Hope, West Palm Beach, Fla.
Rev. David Rosenbaum, Redeemer, Merritt Island, Fla., said that while he and his members were spared major damage, there are several homes in the surrounding community that were destroyed by winds and tornadoes. In Texas, a representative from WELS Christian Aid and Relief met with Houston-area pastors and lay leaders and South Central District President Rev. Don Patterson on Sept. 6 to assess the situation in that area. The district has established a local committee to continue to assess needs and coordinate relief opportunities. Patterson reports that many congregations have already been working to help members and friends clean up damage to their properties and homes caused by the flooding. Rev. Matthew Brown from Abiding Word, Houston, Tex., says that more than 40 Abiding Word members mobilized as soon as flood waters receded to help the five member families whose homes were badly damaged in the flood. Other members went door to door in their neighborhoods to see if people needed help. “It was Christians serving and trusting that God provides those opportunities to give the reason for the hope that we have,” Brown says. Several different groups from the area also traveled to Christ our Savior, Angleton, Tex., the last few weekends to help clean out and strip down the parsonage, which was flooded with eight inches of water that didn’t recede for a week. Along with the relief trailers with tools and supplies, Christian Aid and Relief has provided more than $65,000 to help address immediate needs of the congregations and members affected by the hurricane and the flooding in Texas. Some of this funding is being used to help congregations and schools reach high deductibles for their insurance as well to provide gift cards for supplies to members and prospects as cleanup efforts continue. Local district leaders and Builders For Christ are also discussing the possibility of working together on rebuilding homes damaged by the hurricane. Christian Aid and Relief Chairman Rev. Bob Hein thanks WELS members for their outpouring of prayers and support, saying it’s encouraging for people who have been affected by these storms to know they have brothers and sisters in faith thinking of them. One of the main purposes of the synod as described in its constitution is “to extend and conserve the true doctrine and practice of the Evangelical Lutheran church by assisting and counseling in every appropriate way the pastors, teachers, and congregations” of the synod. One way in which this is done is through the various commissions that are a part of Congregational Services. Two of those commissions have recently been blessed with new directors who will serve at the WELS Center for Mission and Ministry. Rev. Jon Hein, who has served as the director for the Commission for Congregational Counseling (CCC) but has been located at the congregation he had been serving, is completing his move to the Waukesha, Wis., area where he will continue his work as director of the CCC. In that role, he will serve not only as the director of CCC, but also as the coordinator for all the commissions of Congregational Services as they work together to help congregations carry out their local ministries. Two other commissions (Adult Discipleship and Youth and Family Ministry) will also welcome a new leader who will serve as the director of both commissions. Rev. Donn Dobberstein recently accepted the call to serve as the Director of Discipleship and will be relocating to the WELS Center for Mission and Ministry in the coming weeks. These two calls demonstrate the importance of the role that the synod plays—not in carrying out the actual ministries, which are done at the local level, but in helping congregations to evaluate their ministry needs and in providing the resources that will help them do that. The CCC will be instrumental in helping congregations assess ministry needs, challenges, and opportunities. The Commissions on Adult Discipleship and Youth and Family Ministry will focus on helping congregations address ministry needs to adults, families, and children. As our synod strives to help congregations to serve people of all ages with the saving gospel, we pray that God would bless the work of these new leaders and their commissions. Pam and her husband Lars are two of the more than 35 WELS members from the greater Austin and Dallas/Fort Worth area who traveled to Edna and Victoria, Tex., Aug. 31-Sept. 3, to offer support and relief to those communities which were affected by Hurricane Harvey. “God has visited us with a burden in our region, and we want to fulfill the love of Christ by carrying each other’s burdens,” says Rev. Donald Patterson, South Central district president. These volunteers partnered with members of Redeemer, a dual-site ministry with worship in both Edna and Victoria, to address the critical needs of the congregation’s members, their friends and family, and also the community. Wind damage, downed trees, and loss of electricity for a long period of time are just some of the issues these communities are dealing with. “We’re there to help the local congregation. But they don’t just want to serve their own; they want to impact the community—to shine Christ’s light,” says Rev. Daron Lindemann, pastor at Holy Word, Pflugerville, Tex., and district relief coordinator. WELS Christian Aid and Relief is assisting with this local effort, including sending several Christian Aid and Relief trailers filled with generators, chain saws, and other relief supplies and equipment to use for the clean-up. Local Texas congregation members donated water, cleaning supplies, and food to help those in need in those communities. The relief team responded to over 50 emergency requests in Edna and Victoria. While many came from Redeemer members, the word spread quickly that their church was actively responding with a relief team. Friends, neighbors, and members of the community called in requests as well. WELS Christian Aid and Relief also has already sent $25,000 to help address immediate needs of the congregations and members affected by the hurricane and the flooding. This is just the start of the relief efforts following Hurricane Harvey; as flood waters recede allowing access into the Houston area, efforts will be focused on Houston-area congregations that are dealing with the effects of catastrophic flooding in the area. Some locations got more than 50 inches of rain from Harvey. As Christian Aid and Relief considers how to best mobilize volunteers as they meet with local leaders, Hein says those who are interested in volunteering can sign up online at wels.net/relief or contact Rev. Richard Warnecke, a WELS Christian Aid and Relief committee member, at 262-424-8792; pastorwarnecke@christpewaukee.org. Hein says WELS Christian Aid and Relief is not shipping supplies or donated items to Texas at this time. “If you wish to support this relief effort, the best way is to direct financial gifts to WELS Christian Aid and Relief and designate the Hurricane Fund,” he says. WELS Christian Aid and Relief will then provide funding for supplies and relief efforts in coordination with the local pastors in the affected areas. Donate to Hurricane Harvey relief online at wels.net/give or by sending checks earmarked for WELS Christian Aid and Relief Hurricane Harvey to WELS Center for Mission and Ministry, N16W23377 Stone Ridge Dr., Waukesha, WI 53188. View previous WELS updates about Hurricane Harvey. View a slide show from our congregations and volunteers. Relief efforts have been ongoing in the flood-damaged areas of Malawi. WELS missionaries in Malawi, leaders from the Lutheran Church of Central Africa – Malawi (LCCA), WELS Christian Aid and Relief, and WELS Kingdom Workers have been collaborating to meet the needs of affected LCCA members. So far, Christian Aid and Relief has designated $50,000 to relief efforts, but initial assessments indicate that needs are extensive and ongoing. In January, Malawi experienced damaging floods that destroyed or damaged the homes of an estimated 3,200 LCCA families and nearly 20 LCCA church buildings. The floods also washed away crops, depleting the local food supplies, and increased the threat of diseases such as malaria and cholera. So far, WELS Kingdom Workers volunteers and LCCA leaders, working with Christian Aid and Relief, have been distributing supply buckets with sheet plastic, nails, and blankets to provide temporary housing to affected families, but traveling the flood-damaged roads can be difficult. To help expedite the travel and delivery process, Christian Aid and Relief is funding two more Kingdom Workers volunteers to rent additional trucks in Malawi and get supplies to members more quickly. WELS Christian Aid and Relief Director of Operations Mr. Mark Vance is planning a trip to Malawi in March to assess the damage and determine ongoing relief needs, particularly food and medical needs in addition to the structural damage to homes and churches.